The concert is set for April 8, 2018 in the Isaac Stern Auditorium at Carnegie Hall. “VOENA Children’s Choir received this invitation because of the quality and high level of musicianship demonstrated by the singers as well as the exceptional quality of their audition recording. It is quite an honor just to be invited to perform in New York. These wonderful musicians not only represent a high quality of music and education, but they also become ambassadors for the entire community. This is an event of extreme pride for everybody and deserving of the community’s recognition and support,” said Jonathan Griffith, Artistic Director and Principal Conductor for DCINY. The singers will spend five days and four nights in New York City in preparation for their concert, spending each afternoon in rehearsal for the DCINY performance. The VOENA students will also take this opportunity to explore and take in the culture of New York City. Director Annabelle Marie really hopes the community will support this wonderful opportunity and help defray the costs for the choir as it will take an estimated $75,000 to cover the total cost of travel, lodging and meals. The students are excited about the invitation and they are working hard preparing for a Benefit Concert that will take place at the Napa Valley Opera House on October 15, 2017 at 2:30. The Opera House is sponsoring the event along with other talented local musicians, Jeff Campitelli, former drummer for Joe Satriani, Peppino D’Agostino, international acoustic guitarist, and Carlos Reyes, world-renowned Paraguayan harpist and violinist. Of course the VOENA children will also be performing a few songs as well. "It will be a night to remember," said Annabelle Marie. Tickets can be purchased at ticketmaster.com or through voena.org. Members of the community are encouraged to give financial support in sending these student singers to New York by contacting Michelle Fulbrook at (707) 363-1538 or via email at michelle@voena.org or by donating online through voena.org, tab donate. VOENA is an award-winning children’s a cappella singing group, serving over 120 children ages 6 to 18 from all over the Bay Area at two regional chapters in Benicia and Santa Rosa. VOENA in the schools program serves Title 1 Schools in Benicia and Napa. Director, Annabelle Marie inspires children to celebrate music through voice, sound, rhythm, and physical expression. Singing in over 25 languages, VOENA has performed around the globe inspiring audiences at the 2012 London Olympics, the Grand Ole Opry, as repeat guests at the White House, for Pope John Paul II at the Vatican in Rome, and as goodwill ambassadors to Bali, Italy, Ireland, China, and Japan. VOENA was the first American choir to sing at the Soweto Festival in South Africa. 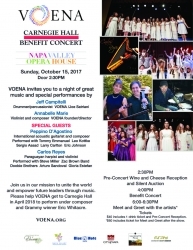 VOENA will be performing at Carnegie Hall, New York City in Spring 2018 to spread their mission to unite the world and empower future leaders through music.